Bosque Farms Prairie Dog Relocation Project: We made the paper! A big thank you to all who attended last Sunday. It was a long 10 hour , hot day for all of us. Thank you again to Prairie Dog Pals for a hard days work and for all of the continued relocation work. A few highlights of the day, talking to many locals who are clear PD advocates and talking to locals who are not PD advocates and have valuable experience with trying to control populations. (It is always good to hear all sides to an issue) 2. Getting the remaining PDs captured out of the field next to North Bosque Loop RD. 3.Having kids join us for part of the day. 4.Gaining a real love for ice. 5. Sharing the day with friends doing a task that provides a community service. 6. Hearing the PDs in the field next to us chattering at us and telling them, "We are coming for you." 7. Knowing that even though we did not get them all, some of them are being moved to a better home. Wow look at all this hay! Paul with two caught at once. Thank you for visiting our BF Prairie Dog Relocation Project Blog. We are a group of residents that live in Bosque Farms, New Mexico that have committed to a project to relocate a 100 to 200 Gunnison Prairie Dogs that live in a colony that is located on that longer contains the vegetation necessary to feed this population of prairie dogs. We are partnered with Prairie Dog Pals, a local non profit to arrange the relocation of this colony. 4. 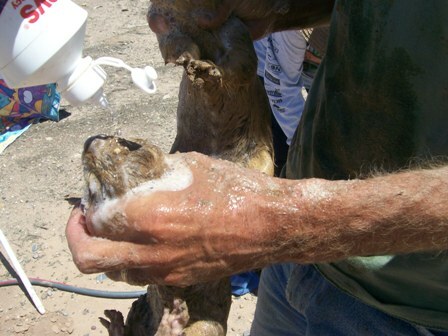 People to join us that are interested in conserving the population of Prairie Dogs in the Bosque Farms/Peralta. Los Lunas area and a few volunteers to assist the day of the move. 1. Prairie dogs are a keystone species with up to 205 associated vertebrates (9 considered dependant) living with them, using their burrows, or predating upon them. 2.There are 5 species of prairie dogs. The ones in Bosque Farms are Gunnison’s. 3.Over the last 100 years prairie dogs have been reduced to 1% of their former range and 2% of their population. 4.Some of the species are listed under the Endangered Species Act. Others are being considered for listing. 5.New Mexico has the smallest remaining acreage of prairie dogs. 6.Prairie dogs have the most complex language of any animal ever studied. 7.They have over 200 words and can form sentences identifying intruders by color, size and type of risk. 8.Burrows are complex with a different area for each function of life. There are living chambers, sleeping and nesting rooms, a food storage area, toilet rooms, and flood chambers. The burrows themselves generally include a second entrance or escape way, air chambers, and listening posts in addition to the main entrance.